Where does the beginner adventure racing start out, what work out plan for adventure racing should I use. What adventure racing gear is needed, what will race day be like, these are some of the questions answered by Beginner adventure racing advice. 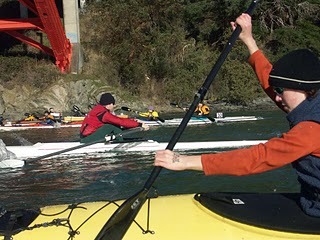 Some racers have come from a tri-athelon background and for them the conversion is easy, it’s just a matter of replacing swimming with kayak or canoeing. Running and Mountain biking should be practised on trails gravel roads and single tracks, starting off with 30 minute sessions and building to 90 minutes remembering to put in some varied countryside and hills if possible. Navigation is another area which is overlooked; if you have an orienteering club near you it is well worth joining then you can practice your running and navigation at the same time. A beginner adventure racing does not need special clothes to start with a race vest and shorts or leggings will do fine for the first few races, together with a running shoe or cross trainer which are the most suitable footwear for both for the running and mountain biking sections. You will also need a hydro-pack or bottle carriers for water and snacks such as energy bars or gels. Compass and map holder. The biggest expense will be a mountain bike, although any bike can be used the most popular one is a hardtail that has front suspension. Remember also to have a toolkit with patches and gas inflator together with spare tubes. You will also need to put together a small first aid kit, with plasters, steristrips, antiseptics, scissors, tweezers and don’t forget you will need Vaseline or Bodyglide to help prevent saddle sores and the like. Beginner adventure racing involves passing through a number of check points or control points, at these points the beginner adventure racer will need to either clip a race card or have their time recorded in a passport. Care must be taken not to lose the card or passport as it is the only way of proving you have followed the correct course. Except in Score races where competitors a given a set time to reach as many check points as possible it is important to move through the checkpoints in the correct order. What type of race should a beginner adventure racing enter, the sprint race lasting a few hours or a longer race up to 24 hours. Many people assume the sprint race is the easiest, however the truth lies in the name a sprint is usually fast paced, so if you walk or jog you will be in trouble, if you have a background of running this is a fine starting point. The longer the race the slower the pace for the beginner adventure racing and the slower pace allows one to take in and enjoy the great outdoors which is a big part of what beginner adventure racing is about, meeting people and discovering new places whilst learning about oneself. Some races have courses laid out with marshals, markers and tapes to keep you on the course, others require you to navigate with compass and instructions from point to point. In the latter races you may benefit from being with someone else, however be wary of blindly following the person or team in front they might be lost. Transitions are where the beginner adventure racing changes from one discipline to another. This is where time can be lost or gained; more often than not this is where the beginner adventure racing loses out. Approaching the transition is where the beginner adventure racing should be mentally rehearsing what they will do, perhaps change socks, replenish water bottles and restock gel or food bars. The least you do the quicker the changeover will be, however is you are developing a hotspot or blister you should deal with it before continuing. Once away from transition it’s about getting back into the racing rhythm and finding the next checkpoint. and the next transition area until you arrive at the finish line tired and dishevelled and perhaps collapse in a heap saying you will never do it again. When you reflect on Beginner adventure racing, you can look back in pride having taken on nature, the course designer and challenged yourself and won, yes that’s right everyone is a winner. Rather than sitting in an armchair watch others, you have gone out and done it yourself, and gained some healthy exercise at the same time.